Although Jane Hading (1859-1940), Lily Elsie (1886-1962), and Billie Burke (1884-1970) gained fame as stage actresses, their popular appeal also rested on their ability to cultivate a glamorous appearance. Their careers illustrate the early transformation of actresses into marketable commodities whose celebrity status depended on the consumption of their images. This celebrity, in turn, was used to market an array of beauty and fashion goods to women striving to emulate them. 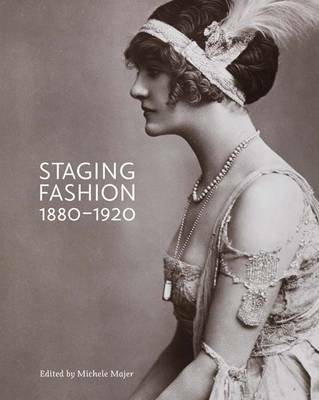 The three women featured in Staging Fashion exemplify the factors that ensured success for 20th-century actresses. Each of these women was dressed by a leading couturier (or several couturiers), both onstage and offstage. In major cities such as New York, Paris, and London, actresses depended on exquisite, custom-made gowns both to secure principal roles and to maintain popularity. Their physical beauty, which was consistent with elite notions of class and race, was depicted on postcards and in popular fashion and theatre magazines and newspapers. Finally, these actresses developed distinct "personalities," which were conveyed by their stage roles and in numerous photos and articles.